ICO (Initial Coin Offering) has gained quite a lot of attention recently as a way for blockchain startups to raise funds. Part of the reason why it’s so popular as a fundraising option is that because it provides an easier access to investors funds for entrepreneurs who might have found it difficult to launch their business ideas through traditional fundraising schemes such as IPOs where severe regulations usually prevented them from meeting all the requirements necessary to even be qualified as a market participant, let alone to be attractive enough to be able to gather sufficient funds from investors. However, with the easy access to investors funds comes a number of fraudulent activities where a group behind an ICO project suddenly disappears without delivering their promises and runs away with the raised funds. It’s not surprise, then, that people have mixed opinions on the practice of ICO. While the advocates are heralding it as an innovative way of collecting investors money, sceptics are dismissing it as a hotbed of ponzi / pyramid schemes. Not only people have mixed opinions on the ICOs, but countries too. Some countries ban ICO (and even shut down cryptocurrency exchanges) and others try to embrace this paradigm shift in the way in which startups gather funds. In this article, we will look at some of the best countries to start an ICO campaign. The analysis is based upon an independent research we’ve conducted on some of the most successful ICOs. Best country has the biggest amount of successful ICOs. We have used the data in this website as a reference. First, we’ve sorted the ICOs by “Total Raised” in the descending order and then chose the top 100 campaigns. We then contacted the projects teams to identify their countries of registration. The result is shown in the graph below. Of the 100 projects, 47 of them couldn’t be reached or simply declined to comment on their registration status. 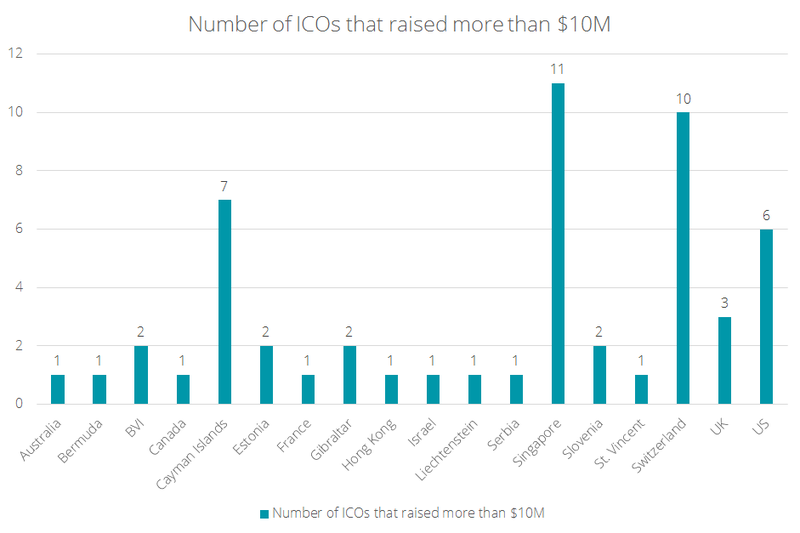 Therefore, the following data are based on the 53 ICOs that have raised more than $10 million in their token sales. In addition, all of the 53 projects meet the rest of the above criteria to be qualified as “successful”: they are currently in operation and none of them has been sued due to a fraudulent scheme. Note that we decided not to include the United States in the list after the SEC issued the Munchee order which prevented Munchee Inc., a California based company that created a blockchain application that allowed its users to post the reviews of restaurants, from continuing its ICO campaign on its second day. Although the company states in its white paper that “a Howey analysis has been conducted to determine that, as currently designed, the sale of MUN utility tokens does not pose a significant risk of implicating federal securities laws.”, the order argued that its MUN tokens were actually “securities” because they are considered to be “investment contracts”. The fact that the Howey test is currently the only reliable way for people planning an ICO to determine whether its token is deemed to be a “security” but the SEC can simply disagree with the “in-house” analysis implies that potential entrepreneurs could be more or less at the mercy of the SEC’s decision if they don’t register their tokens as securities or qualify for exemption. The unpredictable nature of the SEC ruling led us to exclude the United States from our analysis. The country that boasts the 7th highest GDP per capita (as of July 1st, 2017) and often ranks among the top countries in the PISA test is also home to 11 (20,7%) of the 53 successful ICO campaigns examined in our survey. There are several factors that make the country such an attractive jurisdiction to the entrepreneurs in the crypto space. MAS, the country’s financial regulatory authority, stated in August that it would regulate digital tokens “if (they) constitute products regulated under the Securities and Futures Act (Cap. 289) (SFA)”. This is basically the similar view as the SEC ruling which argued that “whether a particular investment transaction involves the offer or sale of a security … will depend on the facts and circumstances, including the economic realities of the transaction”, basically meaning that the particular nature of ICO tokens is not entirely clear. Nevertheless, MAS issued another statement in December, asking the investors to make decisions “with extreme caution” and recognise the “significant risks” involved in the crypto market in general. While the tone of the latter report seems to suggest its concern about the speculative nature of cryptocurrencies, MAS also makes it clear that it “does not regulate cryptocurrencies”, expressing its neutral position towards the crypto space. In fact, we can say that MAS has rather a favourable attitude towards fintech related businesses. MAS is actually “encouraging more FinTech experimentation” through what it calls “Fintech Regulatory Sandbox”initiative. It encourages “FIs (financial institutions) as well as FinTech players to experiment with innovative financial products or services” and also provides “appropriate safeguards to contain the consequences of failure and maintain the overall safety and soundness of the financial system”. The fact that MAS actively (if not unanimously) supports the development of FinTech initiatives and it is also Singapore’s de facto central bank and regulator of the financial sector should say a lot about its regulatory stance. 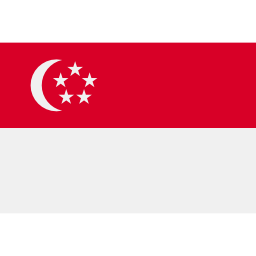 If you are looking for a reliable government-backed support structure in launching ICOs, Singapore should be at the top of your list. Having raised over 20 million dollars in its crowd sale, Enjin is “the ​largest gaming ​community ​creation ​online-platform”. Its main feature is the Enjin Coin (ENJ), a customizable cryptocurrency and virtual goods platform for gaming. The coin is estimated to fail the Howey Test, a set of criteria widely used to determine if the coin should be classified as a security. Therefore their analysis basically claims that the token is unlikely to be classified as a security, which could be subject to heavier regulations following the SEC’s convention. 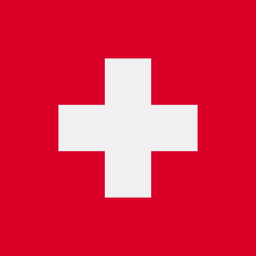 Known for its centuries-old tradition of economic and political stability, Switzerland turns out to be the second most popular country in our research, counting 9 (16,9%) successful ICO campaigns. As in the case of Singapore, its regulatory stance in regards to ICO is not quite clear yet, with its financial-market regulator (FINMA) stating that, while it acknowledges “the innovative potential of such technology”, it also proclaims that some aspects of ICO procedure “may already be covered by existing regulations”. However, the country had already established its position as a favourable place within the cryptocurrency space well before the statement was issued. In 2013, Johann Geversthe, founder of Monetas, came up with the idea of Crypto Valley, named and modeled after Silicon Valley, to make the country a global centre for crypto technologies. In an effort to develop the crypto ecosystem in the country, he created cooperative relationships with various stakeholders in this field, attracted major crypto startups while ensuring that they would be supported in their operations by developing an ecosystem of expert service providers in this space, and promoted his vision in the industry. This led to the foundation of Crypto Valley Association, “an independent, government-supported association established to take full advantage of Switzerland’s strengths to build the world’s leading blockchain and cryptographic technologies ecosystem”. It supports the development of crypto startups by promoting research in this field, providing policy recommendations and organising various industry events, etc. Given this vigorous and active development of private and public initiatives, coupled with the laissez-faire, or rather positive, attitude of the government authority toward the crypto space, it’s unsurprising why we continue to see many crypto entrepreneurs decide to establish their operational bases there. We could thus safely conclude that Switzerland is the best place to receive a wide range of support from the dedicated communities of crypto enthusiasts. It’s a well-known fact that Ethereum was launched in Switzerland, with the Ethereum Foundation based in Zug. It may not be unreasonable to think that many crypto projects related to the Ethereum platform should be established there. Bancor is one of many blockchain projects that leverage the Ethereum ecosystem and Crypto Valley, Bancor itself being one of the Crypto Valley Lab’s Genesis members. It is a decentralized network that allows for the exchange of any ERC20 compliant Ethereum tokens at a mathematically transparent rate while ensuring the continued liquidity of tokens without any counterparty risks. It’s also worth noting that it has raised $153 millions within hours after the token sale had started, making it one of the most successful ICOs ever conducted. However, it has seen its price decline more than 50% less than a month after its launch, resulting in some investors branding it as the “worst ICO ever”. Though it has recovered its initial price level as of December 27, 2017, this track record shows that projects with the most successful ICO campaigns are not necessarily the ones with long-term business success. 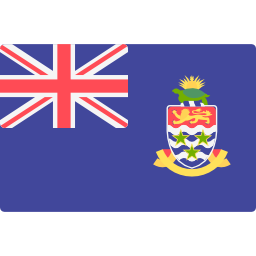 Though not a country, this British Overseas Territory boasts itself as being one of the most interesting regions for structuring an ICO. Through its stable political and legal platform, it has seen many offshore company formations, many of them being institutional clients as they prefer vigorous regulatory and legal frameworks pertaining to the international standards, rather than operating under a merky regulatory environment which would be more adapted to speculative initiatives. This strong regulatory and legal ethos naturally makes this BOT one of the most attractive and reliable areas to start an ICO. At the same time, one of the concerns for those thinking of starting an ICO campaign is to understand the nature of the token issued. Specifically, if it passes the Howey test (as described above) it will be considered as security, potentially exposing itself to the purview of SEC and other regulatory bodies’ oversight. However, some experts suggest that the definition of “security” as specified by the Cayman Islands’ related legislation does not apply to an ICO token, a favourable factor that facilitates the token sale process. Although there still exists certain degree of legal ambiguity in its crypto ecosystem, we see this as the country’s regulatory authorities taking time to ensure that the supervisory structure for all the blockchain initiatives is properly set forth instead of them trying to delay the structural implementation in an attempt to attract as many fintech entrepreneurs as possible in a shadowy legal environment. 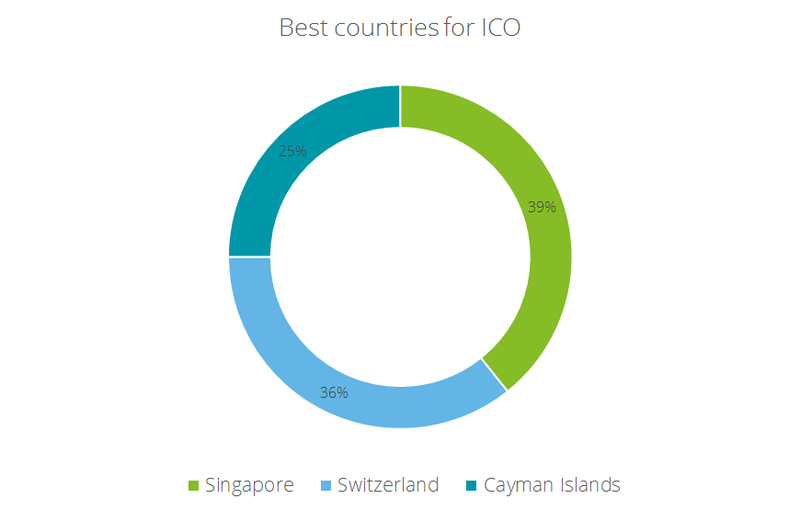 ICO initiatives with a clear set of goals and well-structured roadmaps will see the most success because of the Cayman Islands’ vigorous legal and regulatory ethos, not despite it. Having raised more than $185 millions in 5 days, Block.one’s ICO campaign is considered to be one of the most successful ICO initiatives ever launched. As a platform where “scalable Decentralized Autonomous Communities ‘DACs’ can easily be built, launched, and governed”, it aims to establish itself as the decentralised platform upon which to build all sorts of web applications that are transparent, secure, and cheap — the benefits the blockchain technology is supposed to bring. Of course, regulatory frameworks are constantly changing (especially in the fintech space) and there is no absolute guarantee that one of the countries analysed above won’t suddenly change its legal position and start a major “crackdown” in this sector. However, we believe that they have reasonably stable economic, political and legal basis put in place, ready to welcome budding entrepreneurs in the crypto industry.